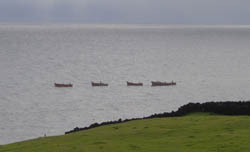 News of commercial and domestic fishing in the waters of the Tristan da Cunha archipelago during the 2008-2009 to 2010-2011 fishing seasons. Ovenstones have made a significant change to the published 2010 shipping schedule arising from MV Edinburgh's short return January / February trip. This trip reverted to a short return passenger and cargo trip as a result of a dispute with the crew in Cape Town. MV Edinburgh sailed on 1st March to begin its postponed extended fishing trip and is now due to return on 4th May. MV Edinburgh is scheduled to spend 48 days fishing from the outer islands of Inaccessible, Nightingale and Gough, catching the remainder of the quota for the 2010/11 season. The ship will return to Tristan da Cunha in late April to load the remainder of the quota, caught by island-based boats around the main Tristan da Cunha island before returning to Cape Town. In September there were 8 fishing days with landings ranging from 2.2 tonnes to 3.6 tonnes with an average of 3 tonnes per day and a total of 24 tonnes for the month. The highest caught by a single boat in a day was 600kg. October's 5 fishing days achieved a similar 3 tonne average and a total of 15 tonnes for the month with again a top tally for an individual boat of around 600kg. The quality of crayfish has been good and survival rates in the tanks extremely good. November has started off really well and the boats are out today for the third consecutive day with the weather forecast looking good for the next few days. Monday 1st November saw a catch of 5.4 tonnes with an individual boat landing more than 700kg and Tuesday 2nd November yesterday saw 3.3 tones landed. So with landings looking strong again on 3rd November things are looking up at last. Fishing in the 2010/11 season has been mediocre so far with almost consistent daily landings around the 3.5 tonne mark. Though disappointing, at least there were 3 fishing days both in July and August to get everyone back into the swing of things. The Factory is operating well and is producing tails, whole raw frozen and whole cooked frozen to match consumer demand for the various product forms. Ovenstones are currently also investigating the possibility of producing cooked, half cut lobster for a new customer. Initial trials have been set up and so far the product is of a high quality. With the various logistical nightmares and distances involved in getting trial product out to the customer, evaluated, accepted and ordered, it is clear to see there will always be a significant lead time involved with new projects. After the first few days of poor landings,the fishermen are carrying extra gear now on each vessel to try and maximise landings until things return to normal. Instead of 10 traps and 26 hoop nets per vessel, it has been increased to 12 traps and 30 hoop nets. Erik is concerned about the state of the weakened West Breakwater following the August storm damage, and hopes the three visiting engineers on the Agulhas trip will provide ideas as to the next critical steps to strengthen Calshot Harbour. Ovenstones, Tristan da Cunha's fishing company, have been made aware that a Florida-based fishing company under the brand name 'Tristan' is marketing a range of fish products, especially tuna. The Tristan Government and Ovenstones want to clarify that this company has no connection with Tristan da Cunha, nor are any of its fish sourced from the South Atlantic (and certainly not Tristan da Cunha) waters. Administrator David Morley reports below on a welcome visit from the Fisheries Patrol Vessel Argos Georgia designed to catch and deter any vessels who may consider illegal fishing operations in Tristan (and Ascension or St Helena) waters. We have deliberately not published any information on the visit until after the mission was complete and the vessel returned to the Falklands Islands. 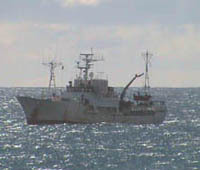 Photograph from David Morley of FPV Argos Georgia off Tristan on 1st April 2010. One of our most popular recent visitors was the Argos Georgia, from the Falklands. This Fisheries Patrol Vessel (FPV) patrolled the Economic Exclusive Zones (EEZs) of the Atlantic UK Overseas Territories of Ascension Island, St Helena and Tristan da Cunha from 20th February 2010 to 18th April 2010. No licences had been issued to fish in the Tristan zone at the time of the patrol. Therefore any vessel fishing within any of the three EEZs would be considered to be engaged in Illegal, Unregulated and Unreported (IUU) fishing. That’s poaching to you and me. The objectives of the patrol were to collect all direct and indirect fisheries intelligence within the EEZs, to offer a deterrent effect and liaise with interested parties on each UKOT. Fishery Officers (FO’s) from all three OTs joined the FPV for a period of the patrol. 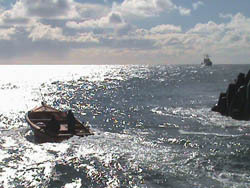 The Argos Georgia entered the Tristan da Cunha EEZ on 31st March 2010 and departed on 8th April 2010. The Tristan EEZ covers a larger area, 217,200 Nm2, than the other two EEZs patrolled. This is due to the inclusion of Gough Island to the south. The FPV paid particular attention to the seamounts where our lobsters are found. No fishing vessels were encountered while patrolling the Tristan da Cunha EEZ. 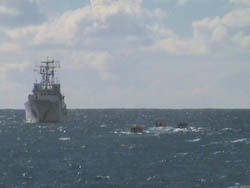 of the patrol in the Tristan da Cunha EEZ. These were Warren Glass, Rodney Green and Sarah Glass, who were onboard the FPV from the 1st April 2010 to the 6th 2010 April. Smith, an old friend of the islanders from the days when he used to Captain the RMS St Helena. The community very much hopes that such patrols will become a regular event in Tristan waters. The new factory has been built to EU specifications and Tristan can be proud to boast a world class lobster processing facility. Positive progress is being made towards the factory obtaining EU access, with sights set on having the plant fully EU compliant with the necessary Government legislation and bureaucratic infrastructure in place by the start of the 2010/11 fishing season. The Tristan Fisheries Department has been nominated as the official Competent Authority to fulfill the role of carrying out the required health and quality checks on the factory and product. Selected staff from the Fisheries Department and the factory will attend formal HACCP and food hygiene training courses in Cape Town early in 2010. Ovenstone views access to EU markets as an important step to diversifying Tristan’s traditional market base for whole frozen lobster, though initial supply volumes to Europe are expected to be limited due to the market preference for a specific size range of whole raw frozen lobster. In partnership with the Tristan Fisheries Department, Ovenstone is in the process of pursuing a MSC (Marine Stewardship Council) eco-label for the Tristan rock lobster fishery. MSC approval of the fishery will verify that Tristan lobster is harvested in a responsible manner. The fishery underwent a MSC pre-assessment in 2008, and a tender process is currently underway to carry out a full MSC assessment of the fishery in 2010. Given the ever growing awareness of eco-labeled fish products across the globe, particularly Europe, it is appropriate that MSC approval of the Tristan lobster fishery runs in parallel with EU approval of the Tristan factory. The poor fishing continues, with only 10 fishing days in the first four months of the 2009 season from 1st July - 31st October, compared with 19 in 2009. The catch of 38.1 tonnes is only 20.6% of the 2009/10 quota of 185 tonnes, and it is feared the quota won't be achieved by break-up day planned for Friday 18th December. There were five September fishing days, with poor tallies, but excellent quality lobster. So far only 22 tonnes have been landed out of the 185 tonne annual quota. The Baltic Trader offload of building materials was hampered by bad weather and it will be unlikely we can fish until she has left. taste the beer," we arranged a time and date for them all to come down and taste the freshly cooked product, hot from the steamer. It went down really well with some of them even arriving with mayonnaise and paper plates. We had finished production for the day and so the crays could be enjoyed at one of the processing tables in the receiving area. Dawn from tourism department now wants to arrange similar events for cruise ship visits as the experience went so well. Factory manager Erik MacKenzie reports that the first 2009/10 fishing day was held on Tuesday 28th July which proved to be a beautiful "summer's" day. The quality of fish was good and sizes mostly big. A tally of 4.6 tonnes caught by the nine power boats meant a great start to the official new season. The fishing day followed moving into the factory on Friday (see report of the opening ceremony on the Factory Building Project page). The only glitch was that some of the part time processors got lost between cloakrooms and processing area, but that won't last long. Overnight freezing in the new blasts is exceptionally good. The new tank room has also turned out brilliantly well in terms of layout and finish - far better than anything Erik has seen in similar South African factories and will compete well with the abalone hatcheries. the new factory trials (see report below). The Tristan quota is reserved for local power boats, that now go out on fishing days when calm weather allows the use of Calshot Harbour. These 9 boats normally carry two island fishermen. The opening of the new factory heralds the re-start of this shore-based operation, halted during the 2008/9 season whilst the new factory took shape. During this period MV Kelso acted as a factory ship with island fishermen based on board for stints normally of one week. Progress on completing the new fishing factory has continued apace over the last six months. The contractors were under real pressure to complete the factory in time for the beginning of the season on 1st July and the final fitting out work will continue into July. Production trials were successfully carried out in June, with five power boats fishing the remainder of the 2008/9 quota deliberately held back for this purpose. See also news of the new factory's opening on the Fish Factory Building Page . Island fishing operations resumed on 21st September with fishing teams Eugene and Simon, Richard and Thomas, Timothy and Ken, Mark and Duncan, Raymond and Colin kicking off fishing operations for the Kelso’s second trip. There is a general expectation that catch rate will improve this trip as we enter the traditional “Big Season” months of October and November. Catches during the Kelso’s first trip were not as high as had been anticipated. The Kelso spent a total 44 days off Tristan. Winter weather conditions resulted in 13 days on anchor with no fishing activity. The average daily catch for the 31 fishing days during the trip amounted to approximately 1.6 tonnes against a budgeted target of 3 tonnes. While fishing generally proved to be good on the south western side of the Island, adverse weather conditions typical of the time of year, often meant that the boats were forced to fish in a small lee area that did not necessarily yield good catches. A total of 48.8 MT was landed during the first trip, leaving a quota balance of 141.2 tonnes to be caught. Ovenstone remains hopeful of landing this quantity before mid December. Due to the unpredictable nature of current fishing operations, the Kelso’s sailing schedule should be viewed as provisional and subject to change in accordance with fishing requirements. Fifth and Final Fishing Team of the inaugural MV Kelso Tristan island fishing trip (using Tristan islanders while there is no land-based factory) came ashore ready for the ship's departure for Cape Town on Friday 29th August. The factory ship will deliver the first of the 2008/9 fishing season's crawfish to Cape Town and onward dispatch to international markets. Ricky Swain and Clive Glass stayed on for another week as the fourth week in an arrangement which included covering for Herbert Glass (Clive's father who is in Cape Town). The Kelso is due to sail from Tristan on 28 August, two weeks later than originally scheduled. Barry's fishing partner is Andrew Green who is currently in Cape Town on medical treatment. Duncan Lavarello is fishing on behalf of Andrew (Duncan was on last week with his partner Mark Swain and stayed on for this week with Barry). 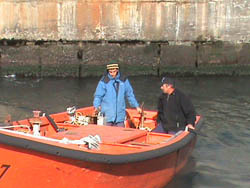 Experienced fishermen Ken and Timothy Green were taken aboard the MV Kelso on 31st July together with the power boat 'Verkenner' to try to boost rather poor catches. This brings the island fishing personnel to 10, with two additional observers (see below). 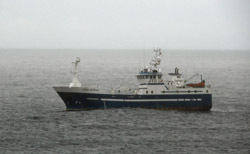 Cynthia Green reports that the eight fishermen based on the first week of ship-based Tristan da Cunha crawfishing arrived home on Wednesday 30th July and have been replaced by eight more men who will fish for the second week. They are expected to remain aboard MV Kelso until Wednesday 6th August, harbour landing conditions permitting. MV Kelso arrived at Tristan on Wednesday 16th July, but poor weather led to passengers not being offloaded until Tuesday 22nd July. Offloading was complete by noon. Six island fishermen went aboard to being the first week of Tristan fishing based from MV Kelso which will act as factory ship whilst the shore-based factory is being re-built. This new practise should mean fishing every day, as MV Kelso finds lee conditions whatever the weather, but catches on the first day were disappointing so two further men and their power boat were taken aboard the MV Kelso on 24th July. Also aboard are Warren Glass and Rodney Green who will act as Fishery Observers. Tristan da Cunha Fishing following the fire which destroyed the shore-based factory. 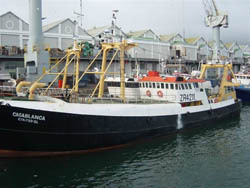 that the longline fishing vessel Casablanca departed Cape Town for a fishing trip within Tristan's EEZ on the 7th July. She is one of the smallest vessels to operate at Tristan, and will be targeting Bluefish, also known as Bluenose on the markets. The Casablanca arrived at Tristan on 16th July and is licensed to fish for white fish up until mid-September. Norman Glass is on board as the Sea Fishery Officer/Observer. Plans for the 2008/9 fishing season have become clearer as the provisional schedule for the fishing vessels MV Kelso and Edinburgh are announced. The schedule can be viewed on our Shipping Page which is updated regularly. MV Kelso will carry out three extended trips of approximately 42, 48 and 29 days from July-November. Tristan power boats will operate from the MV Kelso with fish being delivered to the ship for processing and subsequent dispatch to Cape Town. This will mean that Tristan fishermen (the first woman apprentice also worked in 2007) will continue their employment, but locals will lose their income from processing at the Tristan factory. Factory fishermen will be divided into 6-8 man teams and will fish from the Kelso on a weekly rotational basis. On board processing will be carried out by the vessel's crew. The permanent factory staff will be deployed in the factory rebuild process. Operating from the Kelso, the island fishermen will have direct access to the lee of the island which means that fishing operations will be less affected by weather and harbour restrictions. It is anticipated that the full Tristan 2008/9 quota will be landed over a four month period. Despite the immense logistical challenges presented with the factory rebuild, Ovenstone are intent on having the newly built factory operational by the start of the 2009/2010 fishing season. Friends of the island will be aware that the next year is a crucial time for Tristan's fishing industry, and the island economy which it supports. 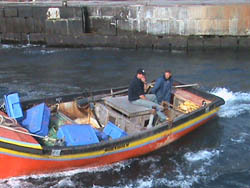 The Tristan Factory boats landed a total 169 tonnes of lobster for the period 1 July 2007 to 13 February 2008. At the time of the fire, a Factory quota balance of 16 tonnes remained to be caught. This quota balance was landed by the MV Edinburgh in March, after the vessel was granted permission to fish the remaining quota balance at Tristan, with a proviso that the vessel fished outside of the factory vessels' traditional fishing grounds. A total 9.3 tonnes of frozen lobster was destroyed by the factory factory fire. 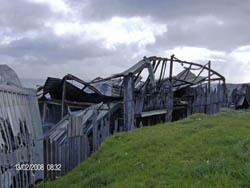 A fire on 13th February 2008 totally destroyed Tristan da Cunha's Fish Processing Factory. where you can follow the story of the fire and its aftermath. can be found on a separate Factory Building Page.